Generac GP 3250 Review - Is It Really Worth Your Money? You should not continue to register losses in your business simply because of power black outs. It may appear quite involving to buy a new generator but when you compare its benefits in the long run, you will begin to ask yourself why it took you so long to acquire this machine. Depending on your specific requirements, Generac GP3250 might be the right solution for you. Let’s have a closer look at this generator. Splash lubricated OHV engine – This ensures that your generator engine components are continuously lubricated to prevent tear and wear. The resultant effect is a long lasting generator. This makes it the best fit for you if you value durable products. Low oil level shutdown – This outstanding feature automatically shuts down generator when oil level is low in order to safeguard your generator’s engine from damage. This feature comes especially handy if you are not particularly keen on the idea of constantly monitoring the oil level, saving you from a lot of hassle. Large capacity fuel tank – This generator comes with a large capacity steel fuel tank with incorporated fuel gauge which provides durability and extended run times. It allows you to fill the tank with large amount of fuel that can run you for almost the entire day depending on the load connected. In addition, the fuel gauge will help you to determine the level of fuel left in the generator so that you can decide whether to top up or not depending on its level. Circuit breaker – This important feature enables the generator to cut off the flow of current in case of too much power to prevent your appliances and equipment from overheating. It therefore eliminates any worries that the Integrated Circuit of your electronics will overheat. It is therefore safe. In addition, its outlets are protected so that you do not suffer an electric shock in case you get in contact with them. Hardened steel tube cradle – This makes this generator more durable and strong. It is therefore less prone to physical damage and can easier sustain harder environments such as busy construction sites etc. Long lasting engine – if a durable engine is your priority, then this is the right generator for you. It is designed in such a way that it is splash lubricated. This ensures that all its movable parts are kept in the right condition without being subjected to any form of damage and thus durable. 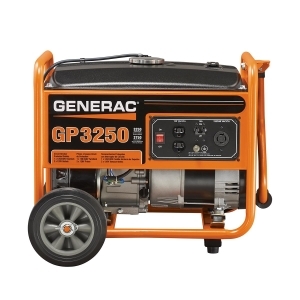 Automatically shuts down – we really like this generator because of its unique ability to shut down itself when the oil level is low. This is important because it prevents any form of damage from being inflicted on your generator due to reduced oil level. In other words, the generator protects itself from damage. Needless to say how beneficial this feature is both for the generator and the owner, since you don’t need to worry that much about oil levels and other relevant maintenance issues. Safe to use – with the presence of a circuit breaker, safety of your appliances is guaranteed. It simply stops the flow of current to ensure that both you and your electrical equipments are safe. 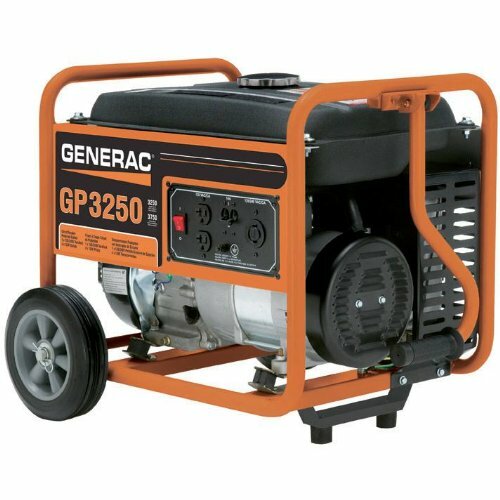 Easy to monitor fuel level – unlike some other generators, Generac 5982 GP3250 has a fuel gauge which helps you to know how much fuel is left in the tank. Strong – who does not like a strong product? The steel tube construction guarantees that the generator will perform well even in harsher conditions and reduces the chance of damage when transporting the generator from one place to another. While providing the necessary durability and strength, the presence of a steel tube construction makes the generator really heavy hence difficult to carry especially by one person. Due to the stricter environmental regulations applied in the state of California, the generator is unfortunately not for sale there. I wish that this generator could have slightly more wattage. While 3250 watts is enough to power a few smaller electrical devices, 4000 or 4500 watts would clearly give more comfort. Generac 5982 GP3200 is indeed worthy consideration. Although it is not ideal for everyone because of its relatively low wattage, it should definitely perform well enough in a home or RV setting. Especially since its price tag is also quite attractive, making it one of the most affordable generators currently available on the market. 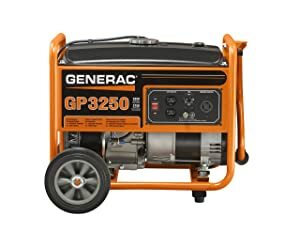 Why are the portable generators usually so loud?